For a while now Maxwell has enjoyed doing lots of imaginary play. Maxwell loves imaginary play and we are sure Maxwell's speech is progressing due to it. 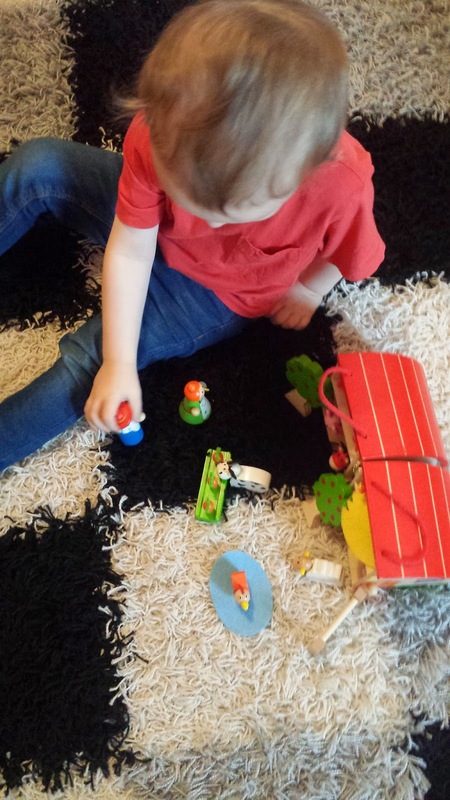 Recently I have been wanting to get Maxwell a play farm set, I figured Maxwell would find it easier to identify animals when they were sat in front of him and I also thought a farm set would be a great way to teach him animal noises. 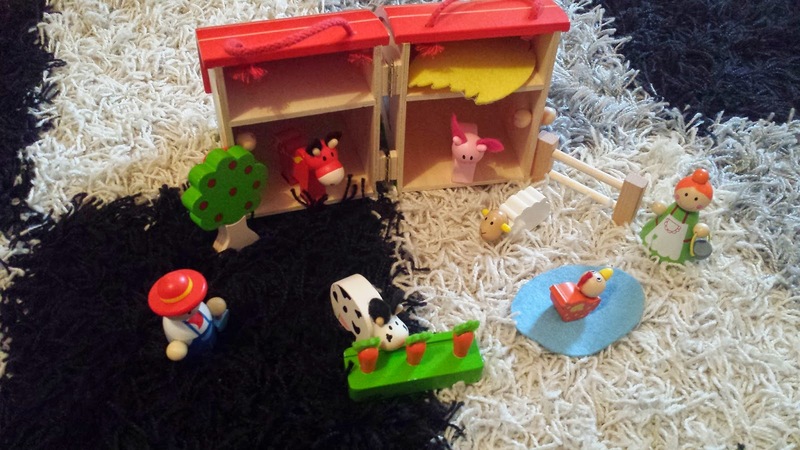 This Christmas Maxwell was sent a beautiful wooden Tobar farm set. As soon as the farm set arrived, we were overwhelmed by it. It was everything I had expected and more. I was generally very impressed with it and to date it is one of my favorite items that I have featured in our gift guide this Christmas. The Tobar farm set is a farmhouse carry case which can be used to transport all the wooden farm pieces around in. The farmhouse opens up and forms a beautiful play set which any child would love playing with. Inside the farm set there are two trees, a carrot patch, a cow, pig, horse, sheep, duck, chicken, two farmers and a pair of fences. A lot of detail has been added to this farm set, from fluffy carrot tops on the carrot patch to the farmer carrying a bucket, there is something which everyone will love to see. All the pieces in the farm set are bright and child friendly however due to small parts I would not reccomend this toy to anyone younger than the age of 3. All the pieces in the farm set are a good size and are the perfect size for Maxwell to clutch in his little hands. The pieces are well designed and are able to stand up on their own. Maxwell and I enjoyed trying to create scenes with the farm set. We loved getting the two wooden farmers to look after their animals, feed their animals and even take them for a ride in their own cart. I adore the Tobar farm set and I believe it is one of the best toys Maxwell has at the present moment. The Tobar farm set can be found here and will set you back around £15. 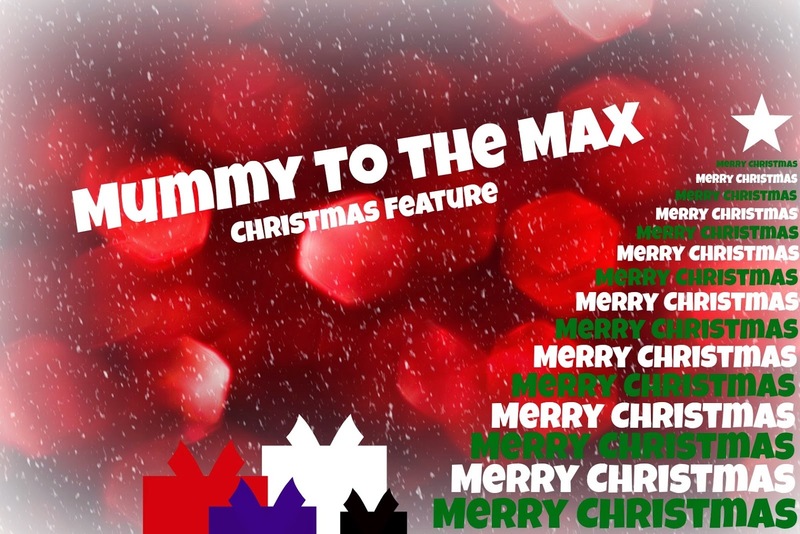 Not only is it the perfect present for a child, it would be a great idea as a stocking filler. Love this! It's so cute, might have to get this for Riley. A great toy for developing their imgination.